This book took me forever to read. Happily, not in a bad way -- I've just been experiencing a definite slow-down in reading speed and down-turn in interest. Again. Sigh. It will change, I am sure. All that said, I have rarely stuck with a book as long as I did with The Moonstone, and there are several reasons I did. First of all, it's excellent. This is an entertaining, interesting, easy read. It does start out a bit slowly -- a lot slowly, in a lot of ways -- but never once did "slow" equate to "boring." That's a feat in itself. Second, it was written (as @xicanti reminded me on Twitter, when I was feeling like a reading lump) as a serial. It works really well with periodic breaks in the reading. I never felt like I'd forgotten what was happening, or who people were, or what clues had gone before. This is with sometimes several days between picking it up, or even a week. I always settled back in quickly and easily. And that was really cool. In fact, it's kind of an ideal sort of read for me right now -- something really short that can be read in a matter of hours, or something of an indeterminate length that I can pick up and put down as necessary without feeling lost. So! For those of you who don't know, The Moonstone is a mystery. It is often listed as the original mystery/detective novel. Wilkie Collins, that fascinating man, wrote it in 1868 as a serial published in his friend Charles Dickens' publication All the Year Round. A fantastic diamond of sinister, possibly cursed origins is left to Rachel Verinder, a young noblewoman, by her nefarious uncle upon his death. She wears it the night of her twenty-first birthday party, despite her mother's, cousin's, and closest servants' wishes. That night, it is stolen from her cabinet by a thief unknown. This sets into motion a series of dramatic events around the household, a tangle of relationships, events, and clues that even the greatest detective in England is hard-pressed to unravel. As a fan of mysteries, particularly cozies and Sherlock Holmes, it was really quite fun to see some of the conventions pop up, knowing that this was probably the first or one of the first instances, and knowing that the original readers would have been drawn in to the twists and turns of the labyrinthine plot. At this point, I've read enough in the genre that some of the outcomes were clear to me at the beginning (not all, though!) and yet that didn't deter from my enjoyment. Some of the specific conventions I noticed were, of course, the red herrings -- so many! And so skillfully deployed. The closed circle of suspects, all available and under suspicion thanks to a dinner party the night before the theft. And the detective! Sergeant Cuff, a man who could easily have been Sherlock Holmes' grandfather. He clearly deserves some of the credit for The Great Man: his slightly off-putting manner, his careful observation of the evidence and his attention to the slightest detail, his exasperation with the local constables, his clear intellectual superiority. There was a dramatic twist near the end, and a denouement that satisfied all the remaining questions. But there were also things that made this read fresh and interesting. For one thing, I had no idea before I started that this was an epistolary novel, in the form of reports written for the record by the participants in the case. Collins' attention to his characters' voices was meticulous. There are several different narrators, though the longest portion of the tale is told by Gabriel Betteredge, the chief steward of the manor house in which the theft takes place. We can get a lot from what Betteredge tells us, even when he doesn't realize what he is revealing -- and he also reveals a lot about himself as a person, in what he says, how he says it, and what he doesn't say. This is the case for each of the narrators, but especially for Betteredge, from whom we hear the most. He can be sexist, extremely xenophobic, and astonishingly self-absorbed -- but he's a fully-developed, fully-rounded character and I found myself liking him for his good points while still being aware of his flaws. Given that his flaws are a difficult sort for me to get over, it's no small feat that I generally didn't mind spending time in his head. Contained within these narratives are some surprisingly modern views. Collins' female characters are strong; and if they seem a little melodramatic, well, the entire book is written to be a bit over-the-top (it was a sensational novel, after all.) The foreign characters, the Indians, are treated with respect by the author as well -- they are operating under different cultural mores than the narrators, but they treat those they meet with dignity and respect except for those who stand in their way. It's not an entirely flattering treatment, but it's a startlingly even-handed one for the time. The treatment of the character Ezra Jennings, the mysterious and strange doctor's assistant, is even more compassionate and clearly out of character for the times; the poor man is deeply shunned by all in the small rural community where he resides. In Jennings we get the impression that Collins is directly challenging commonly held attitudes and conceptions on class and social conformity; the man is clearly an intelligent, compassionate, decent human being who has been hounded his entire life by a dark secret in his past that has destroyed his present. Held against him by some of the characters and others in the town is not so much his past but his odd appearance, his lack of roots in the local area, and his mysterious lack of history. Sadly, sometimes one wonders if we've really changed all that much. Highly, highly recommended book. Don't let the fact that Collins was a contemporary of Dickens scare you off, if you are (as I am) extremely wary of Dickens and other authors who were paid by the word/installment. Collins was an extremely talented writer, and The Moonstone reads easily. It's fun to read for its history and as a snapshot of English society, and even more fun for a fan of mystery and detective novels. But it stands on its own merits as well, and it's easy to see why it has stood the test of time. Moonstone is on my "reread regularly" shelf. You've caught a lot of the reasons--the different voices, the way Collins makes you appreciate the different viewpoints, even if you don't agree with them, and the joy of reading one of the early mystery novels (Everyone argues over who really wrote the first one, but who cares? It is, at least early! And good). I read Woman in White and overall I enjoyed it but found that if I set it down for any length of time it was difficult for me to get back into. 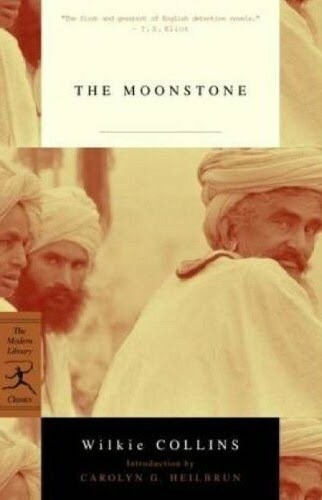 Moonstone has been recommended to me, so it's next on my Wilkie list. Bookwyrme - I'm not sure I could re-read this one regularly, it took me so long! But I could definitely see reading it again. I think I would definitely get more out of it on re-read. Christina - I was really surprised by how easily I could just slip back into this story. The Woman in White is next on my list for a Collins book, and now I'll be interested to see if it works for me in the same way. Aarti - I had never even heard of Armadale until I started reading The Moonstone and I still know nothing about it. What did you dislike about it? Oh, excellent! I'd be curious to know if it lives up to your memories of it. I'm so glad you enjoyed this! I was given it as assigned reading in high school and was so pleasantly surprised by how much I liked it! I would have *much* preferred this to Great Expectations in high school, I can tell you! I think this is an excellent high school text. I'm a little surprised that I hadn't even heard of it until maybe a year ago, given how many people have read it for high school -- but no one else in my extended family had heard of it either. I guess Ontario high schools prefer Dickens? I seem to remember that same teacher making us read Bleak House as well - but since it was one of her favorite books, she really made it fun. I think it's because of that teacher that I came to adore Dickens! I remember her telling us that usually high school students were made to read the shorter novels, like Hard Times and Great E, or maybe Oliver Twist - but she thought Bleak House was so much better, and she taught it in a way that made it fascinating. Teachers can make such a difference in how students approach a book! I didn't like the law stuff much, but the rest of the story was good. Darla, it's so true. I had a teacher who turned Robertson Davies' Fifth Business into an absolute favourite of mine, and there are plenty of adults who have trouble working their way through Davies' work. It's possible if the same teacher had tackled Dickens I might have had a better experience; as it was, the teacher who gave us Great Expectations could make anything tear-your-hair-out awful. I loved the Moonstone! It was so fun to read. Loved it all. And your review -- very insightful. I was seriously overloading with Dickens and Collins by the time I wrote my review -- reading Drood at the same time, whew. This was totally readable. Loved it. Daphne - It was fun, wasn't it? And you were right -- once one got to a certain point, it was hard to put down!